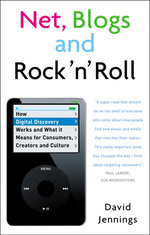 In book form Net, Blogs and Rock'n'Roll is frozen, the final draft having been submitted in April 2007. This page is a repository for correcting errors and tracking any significant updates that affect the substance of the book's messages. If you have anything to add to this, please post a comment below. If it checks out, I'll include it in the main body of the page. On page 128, I wrote, "search engines will increasingly seek to add multimedia capabilities to their search results so that you can try out the audio or video you are looking for." While these capabilities have yet to be fully integrated into generic search engines like Google and Yahoo, since the book was finished there has been a rapid growth in dedicated "playable search" music engines that play you the tracks in the search results (and sometimes allow you to add them to playlists etc): SeeqPod, SkreemR and (on a slightly different model) Project Playlist, to name but a few. For a more comprehensive list see the Music 2.0 Directory search entries. Page 149 — Weedshare — As of April 2007, Weedshare is no longer operating as described in the book. Issues with Microsoft's latest version of Windows Media Player were blamed for its difficulties. John Buckman wrote an obituary. Page 149-50 — BurnLounge — My words about BurnLounge in the book were carefully chosen: "reaction… has been circumspect, implying that the model was a multilevel marketing scheme". In June 2007, the Federal Trade Commission in the US began an investigation into BurnLounge's operation. Shortly afterwards, the CEO resigned and it was announced that the company would substantially alter its business model. Nearly a year later, in May 2008, Digital Music News reported that BurnLounge "now appears totally dead". On page 184-85, I wrote, "Imagine specialist music and media search services that help you work from your intuitions… So if you want some music for your home video that sounds similar to a particular Madonna track but doesn't have the associated costs and licensing restrictions, you will be able to use that track as a 'seed' for your search…" Such services are now evolving: see Audiobaba and OWL for example. Again see the Music 2.0 Directory search entries for the latest. This page was last updated on 6 June 2008. Download this page as a printable insert for the book.